Since the District is required to provide shelter for anyone that needs it during weather that has below freezing wind chills between November 1 and March 31, the cold temperatures from the artic vortex prediction have put our preparations in high gear. Central Union Mission’s usual capacity is 170, but we have mattresses for 20 more men during weather emergencies. Along with a safe sleeping space, our guests are provided nutritious meals, hot showers and warm clothing. 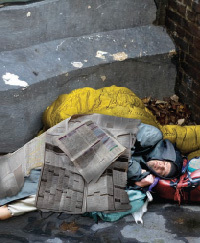 Central Union Mission’s services are funded by private donors who care about the homeless in Washington, DC.